Individual lessons are offered weekly in 45 or 60 minute lessons, depending on the age/level of the student. Students are expected to practice on a well maintained acoustic piano or a full size weighted digital piano. A private lesson focuses on learning Classical repertoire, technical development, development of practice strategies, and music theory. Beginning level students will learn how to recognize, read, and write notes through the use of method books and supplemental pieces. Basic techniques such as hand position, sitting correctly at the piano, penta-scales, chord progressions, and more advanced technique will be taught progressively. Students will also learn music theory and music history. These concepts develop a student's ability to analyze compositions, to solidify memorization, and to become familiar with musical terminology. Theory concepts are reinforced through various activities such as ear training, dictation, and playing interactive theory and rhythm games. 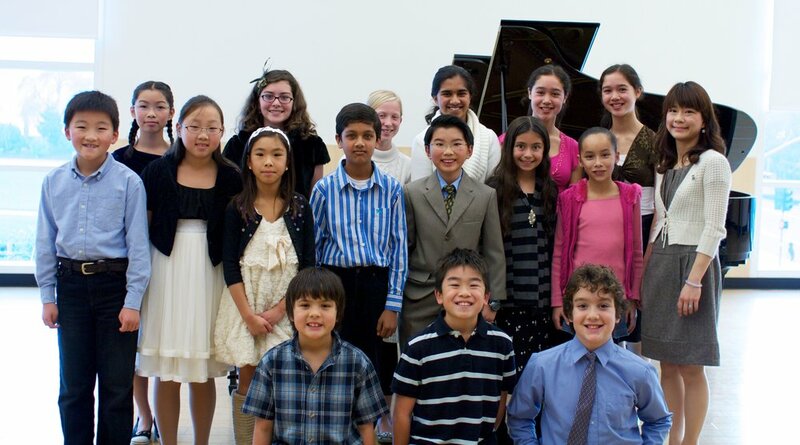 As part of taking private lessons, students are provided performance opportunities such as annual class recitals and public recitals through the Music Teachers' Association of California. Students are also encouraged to participate in the annual statewide music study program, Certificate of Merit. $60 per 45 minute lesson at your home. $80 per 60 minute lesson at your home. Student must have an acoustic piano or a weighted full size digital piano. Parents looking for a piano program that makes their preschoolers smile can look no further! I'm excited to offer the one-of-a-kind Wunderkeys Program! Wunderkeys is a piano lesson program designed specifically for preschoolers between the ages of 3-5. It is an introduction for the very young to one-on-one piano lessons. In each 35 minute lesson, preschoolers are encouraged to explore the piano through a variety of on and off the bench activities. With make-believe-finger- friends and hands on approach games, each child learns to read simple rhythmic notation, listen for musical patterns, and learn math skills to assist musical understanding. There are three blocks (or levels) to the Wunderkeys Piano for Preschoolers program – each 10 weeks in length. To find out if your child is ready for piano lessons read Is My Child Ready for Wunderkeys Lessons? To find out what your child will learn from the first year of piano lessons read Wunderkeys Parent Info Package. $40 per 35 minute lesson at your home. Student must have a keyboard to start lessons.